Setter Periodontics has provided personalized dental care to thousands of patients from the Portland area. Our patients come from near and far to experience the warm, individualized care we provide. We pride ourselves in utilizing the most modern equipment and methods available. Removable partial dentures have metal clasps that clip onto teeth to hold the device in the mouth. Patients need to take these in and out for cleaning after eating and do not replace or preserve all of the hard and soft tissues of the mouth. Tooth supported bridges are supported by the neighboring teeth and have a “fake tooth” in the middle to fill the space. The neighboring teeth are ground down and the bridge is cemented onto them. This type of replacement does not come in and out but can be difficult to clean and often needs to be replaced throughout your life. Dental implants are quickly becoming the gold standard for tooth replacement. They act as an artificial tooth root and a crown will be made by your general dentist after healing. They are not taken in and out and do not rely on the neighboring teeth for support. In addition, dental implants help preserve the bone and gum tissue for a long time. Before a tooth is extracted, we perform a complete examination and generate a custom treatment plan for each patient which includes options to replace missing teeth. This plan is also discussed with your general dentist to make your treatment as seamless as possible. Dr. Setter has been trained in "Minimally Invasive Surgery" so that your tooth is removed in a gentle manner that preserves the gum tissue and bone for future replacement. If you have a question about the prognosis of a tooth or minimally invasive extractions, please contact the office for a consultation. Treating periodontal disease often goes beyond just the gums. In addition to bacteria, an improper bite can also contribute the the worsening periodontal condition. Dr. Setter may recommend a bite adjustment to relieve pressure on certain teeth and more evenly distribute the bite forces around the mouth. This is done over a sequence of short appointments and can be done without anesthetic. Moreover, many patients may require a night guard, which is a custom-fabricated appliance that can be worn at night. Most patients we see in the office have some form of clenching or grinding habit and of those, most are unaware of the condition unless they develop symptoms. A night guard goes over the edges of the teeth and provides almost an "ice skating rink" for your teeth to slide around while you sleep. The goal is to provide rest in your jaw joint, jaw muscles, and teeth. Additionally, it helps you protect your teeth, crowns, and fillings from strong bite forces which can lead to cracked teeth or restorations. Common symptoms of bite problems may include loose teeth, cracked teeth/fillings, soreness in the jaw joint or muscles, morning headaches, uneven bite pressures, an inability to fit your teeth together properly, and changes in the tissues surrounding your teeth. If any of these raise questions about your bite, please give our office a call to schedule a consultation. The first line of defense against the spread of gum disease is a unique type of cleaning called “scaling and root planing.” In this procedure, an ultrasonic cleaning device is used to remove plaque and tartar from your teeth where regular cleaning devices can't reach: under the gum line on the tooth and the root. This procedure is performed by the hygienist under local anesthesia and is usually done over two visits. The goal is to leave a healthy, clean tooth and root surface that makes it easier for the gum tissue to reattach to the tooth. A periodontal cleaning is a professional cleaning you receive from a periodontist or periodontal hygienist. These go beyond a "regular cleaning" that you may receive at your general dentist because we specialize in the long-term treatment of "deep pockets" and patients susceptible to periodontal disease. Most periodontal maintenance visits take between 45-60 minutes and are usually performed every 3-4 months to prevent the recurrence or spread of gum disease. These visits include a review of your medical history, dental history, x-rays, and an update of your current dental condition. Dental hygienists traditionally perform most treatment by hand. However, new and advanced technology has led to more modern methods such as electric scalers. This sophisticated tool allows us to access bacteria below the gumline more efficiently and in less time. To achieve best results, we often use both electric and manual instrumentation in order to create the healthiest periodontal environment when you leave. If you have questions about bad breath or notice bad breath in combination with painful, swollen gums or loose teeth, please contact our office for an evaluation. Dental sedation is a service that can be used when a patient suffers from dental anxiety or dental phobia. We are happy to offer a number of solutions for our patients to make their dental visit as comfortable as possible. Sedation dentistry enables patients, who might otherwise avoid the dentist, to receive dental treatment necessary for a healthy smile. Oral sedation is used to "take the edge off" and provide relaxation to patients in the form of prescription pills. This medication can be given to a patient the night before a dental procedure or 30-60 minutes prior to the dental appointment, depending on the patient and procedure. Oral sedatives do not provide pain relief, so local anesthetic will also be administered. IV sedation provides relaxation medication through a small IV inserted in your hand or arm. Since IV sedation does not provide pain relief, a local anesthetic will also be administered. Intravenous sedation allows patients to still be awake but in an extreme state of relaxation, feeling little or no pain. Dr. Setter is trained and licensed to provide IV sedation to patients in the office in order to make you as comfortable as possible while you’re with us. 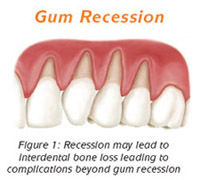 The solution to this situation is a soft-tissue graft, also known as a gum graft. During this procedure, tissue is transplanted to the gum area, covering the roots and restoring the gum line to its original, healthy location. 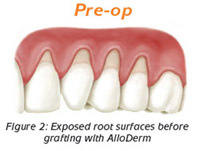 A soft-tissue graft is aimed to thicken the tissue, thus protecting your roots from decay and helping prevent additional gum recession. When a tooth falls out or is removed, an indentation can appear in the gums and jawbone just above the spot where the tooth used to be. This occurs because the jawbone slowly dissolves in response to the empty space and loss of function. In combination with replacing your missing tooth, we can provide ridge augmentation, a procedure in which we smooth out the indentation to recreate the original curvature of your gums and jaw. This procedure generally includes bone and/or soft tissue grafting to restore the missing tissues, and in some cases must be performed prior to the placement of implants to ensure that sufficient bone is available to securely retain the implant. If you have too much gum showing when you smile, causing your teeth to look short, we call this a “gummy smile.” If your gum line is uneven, causing some teeth to look shorter than others, we call this a crooked smile. Both situations can be easily remedied with a procedure referred to as a gum lift or crown lengthening. During this procedure, we reshape the gum tissues to provide a natural-looking smile and gum line.